The pictures on this month's page are from my August 1994 road trip to the Studebaker National Museum. 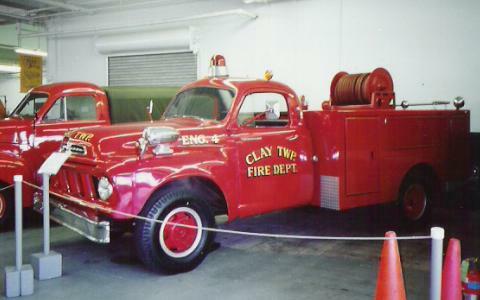 This neat 1958 Studebaker Transtar Fire Truck was on loan at the time from the Clay Township, Indiana Fire Department. It has been outfitted as a brush fire and general purpose fire truck. Studebaker used the Transtar name for its commercial trucks from 1956 to the end of production. Transtars ranged from half-ton light duty to two-ton heavy duty models. A number of Transtars were built as cab and chassis units and sent to specialty body companies for completion. The Studebaker Fire Engine in the first picture is a 1928 Big Six that was used by the St. Joseph, Michigan Fire Department until the early 1950's. It was built as a bus chassis in South Bend and outfitted as a fire engine by the Boyer Fire Apparatus Company of Logansport, Indiana. 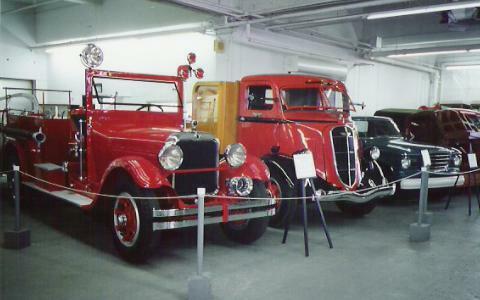 Boyer converted a number of Studebakers and other makes for use as fire engines. The sleek Studebaker Cab-Forward was introduced in 1936 and continued essentially unchanged through 1940. 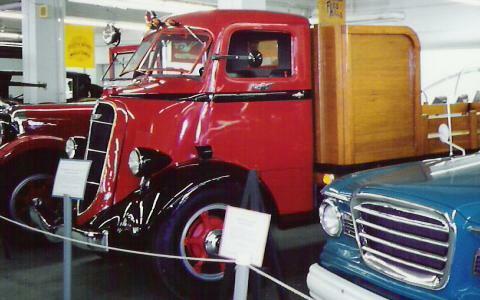 Many of these interesting trucks were produced as cab and chassis units and sent to specialty body manufacturers for completion. The Studebaker Cab-Forward design was also available as a semi-tractor which could pull a variety of trailer types. 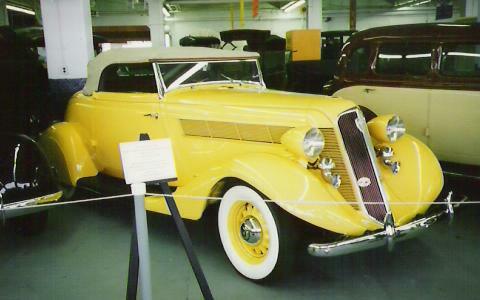 This beautiful 1935 Commander Roadster is part of the Studebaker National Museum's collection of older Studebakers. The 1935 Commander was powered by a 250 cubic inch straight 8 cylinder engine rated at 107 horsepower. This was basically the same engine used in the more expensive Studebaker President but with a lower horsepower rating.